Grootbos Private Nature Reserve activities and tours can be enjoyed with the children at the beach, on the sea and in the reserve. Explore Stone Age coastal caves, relax at the spa or swim in the pool. A Grootbos Private Nature Reserve holiday offers a back to nature experience with botanical tours, horse riding, birding, walks to stone-age coastal caves, exceptional land-based whale watching, shark cage diving and boat tours to see other marine life like penguins and seals. There is much to recommend Grootbos to any nature lover. Grootbos Private Nature Reserve activities suit all ages and families are most welcome. Children at Garden Lodge have a special children’s programme that is both educational and fun. Conference delegates will enjoy a programme packed with exciting guided tours and great activities on and off land. Teambuilding activities can also be tailored to suit company requirements. Conferences of 10 - 60 delegates can be arranged for resident guests. Whilst guests enjoy sumptuous accommodation and cuisine, the Grootbos Creative Conferencing & Events Centre will provide a sophisticated venue and state-of-the-art facilities. A fully qualified beauty therapist and masseuse offer a range of treatments for guests in the salon or in the guest suite. Massage, reflexology, facials, manicures and pedicures are included in the treatment menu. The family friendly Garden Lodge at Grootbos has a children’s programme and specialized guides who accompany the children on treasure hunts, beach excursions, rock pool meanders and trips through the reserve. Horse riding in the reserve is a great way for families to get close to nature. Paddock games include soccer, trampoline and volley ball. There is also a swimming pool. The environment is explored fully and any exciting finds like shells are identified back at the lodge and the children learn how to respect the natural habitat. Families can plant a tree which is tagged so they can show their friends back home on Google Earth. Great children’s menus are available as well as refreshments and snacks for activities. Guests are free to enjoy the miles of beautiful coastline or go on a Grootbos guided walk and talk exploring an ancient sea cave, rock pools, pristine beaches and cliff paths as well as whale watching in season. Guests can enjoy whale watching between June and December from Hermanus round to Walker Bay and the De Kelders cliff paths. Walker Bay is where the mothers and their calves come right in to within 30 metres of the shore. Marine Big Five safaris in a custom made boat take guests onto the ocean for the adventure of a lifetime to see whales, dolphins, Cape Fur Seal, Great White Shark and the African Penguin. Gansbaai is one of the most popular destinations for shark cage diving. Guests go out to sea in specially built boats on a 3 – 4 hour excursion. Once a shark is spotted close by, a cage is lowered into the water for a guest to have a face to face encounter. Others on board can also watch from the surface. This popular activity is one of the most satisfying and enriching ways of exploring Grootbos Private Nature Reserve. Experienced and knowledgeable equestrian staff at Grootbos look after 18 horses at the stables and accompany guests on outrides. The horses are well trained and Grootbos has safe, comfortable equipment. Grootbos offers many wonderful hiking trails that weave throughout this majestic reserve where flora and fauna, animal tracks, local insects and flower details can be observed on these lovely outings. Guests are able to enjoy forest walks, guided nature hikes and 4×4 reserve drives through the last of the Cape’s Milkwood forests and the awesome floral kingdom. On a guided walk through the nature reserve trails, visitors are more likely to encounter birdlife than if they had been in a vehicle. Due to the variation in habitats on the reserve, around 107 bird varieties can be seen. On the coast the rare African Black Oystercatcher and Cape Cormorant can be spotted while inland amongst the Fynbos and forests guests may see the elusive Knysna Woodpecker and endemic Cape Sugarbird. Grootbos is an accredited bird-friendly establishment (Bird Life South Africa). 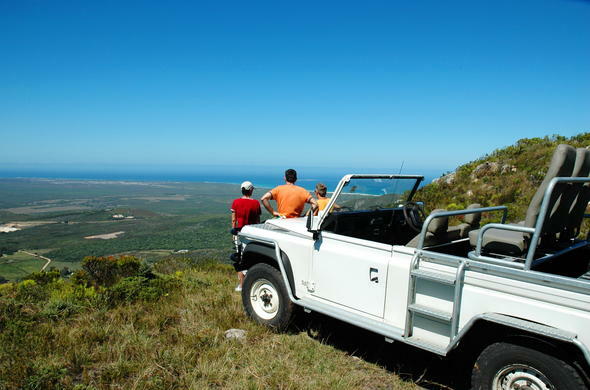 Grootbos Private Nature Reserve in Gansbaai, South Africa, offers nature walks and drives. See endangered endemic flora and fauna, miles of sandy beaches and enjoy scenic Atlantic Ocean views. Grootbos Private Nature Reserve offers wonderful horse riding in unspoilt nature or on the beach. Children can ride a pony.